For 7 days and then part two starting. The art includes pages by Kirby, Starlin, Wood, Colan, Buscema and more. It will be available for viewing at the New York Comic Con. 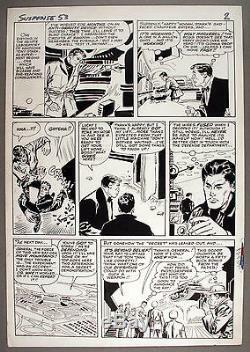 Nice Vintage Don Heck page from early Marvel Era from 2nd Black Widow Issue, Tales Of Suspense #53 Page #. Features Tony Stark in his Lab when Happy Saves him. Our customer service is exceptional. The Superworld Team guarantees your satisfaction! Joe, Ted, Jose, and Lisa See us at shows around the country! The item "Don Heck Tales of Suspense #53 2nd Black Widow Issue, Early Iron Man" is in sale since Sunday, October 09, 2016. This item is in the category "Collectibles\Comics\Original Comic Art\Splash Pages".